Bout of Books 22 is this week! I'll be updating daily on Twitter and will share my progress for the entire week here next Monday. This is a short and sweet, gentle novel set in a small idyllic town in the 1970s. I enjoyed the way it was written and the fact that the main character enjoys vintage books and used bookstores. My review will publish to the blog tomorrow. I read this eight years ago according to my Goodreads account, but I had no memory of it, so I decided to listen to the audiobook. It was very good, especially toward the end when the truth started to come out. I'm planning to listen to the second book soon. I skimmed the second half of this book since middle school and high school curricula won't be relevant to me for another 8 or 9 years, but I found the author's approach to homeschooling very compatible with my plans. I'll have a full review up on Goodreads later this week. This is a YA romance novel with a few things in common with John Green's Turtles All the Way Down. It was very slow to start, but was surprisingly emotional as it went on and the two main characters got to know each other. Review coming soon. Like this author's All Alone in the Universe and Criss-Cross, this is another realistic fiction book where it feels like not much happens. The writing is very strong, but not every is going to gravitate toward the story. My review will be up in a week or so, hopefully. I keep forgetting that I'm reading this. I will really try to remember to finish it this week. I'm reading this one with my four-year-old. She loves it, but I think the first two books were better. I loved Beth Kephart's YA novel, This is the Story of You, so I could not pass up the chance to read this new middle grade book involving a prison break in the Adirondacks. I've read four chapters and the writing is just beautiful. I have a feeling this will be the book I focus on the most this week. I just started the audiobook of this cozy mystery. It's good so far, except that the narrator keeps pronouncing the word "calliope" as "callie opie" and it's completely distracting. Nice variety of books. Isn't it nice to have an online memory like Goodreads which keeps track of books that you might have forgotten. I'm glad the Patricia Cornwell was good the second time too. Come see my week here. Happy reading! I'm happy to read about a new book by Cynthia Rylant, sounds wonderful, Katie. I also noted Wild Blues by Kephart, also looks like one I'd like to read. Thanks! It's so weird when I see that I've read something on Goodreads and I cannot recall the details. Did it come back to you as you began reading it? Also, I hope you enjoy designing your curriculum. We also home educate our five children (ages 14 down to 4). After teaching in the public schools for years it was a huge change, but I wouldn't give up these years at home for anything. I still like teaching online courses through our local college (especially for education majors and librarians), when I'm needed. Otherwise, it's a joy to watch the continual growth and learning of my Littles. Have a wonderful week, Katie! I love your variety of reading formats - from e-books to audio books to physical copies. Awesome! Have a great reading week ahead! 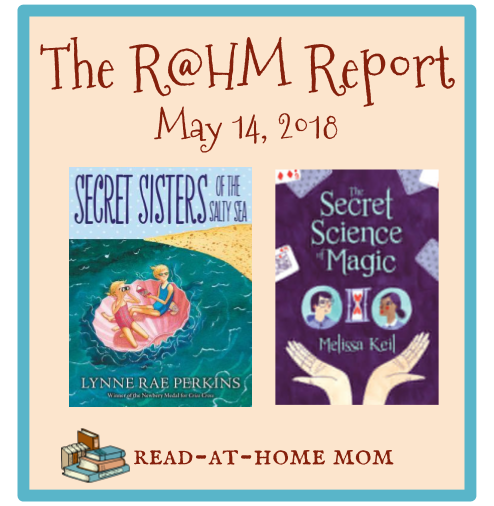 I am a fan of Lynne Rae Perkins so I am looking forward to Secret Sisters of the Salty Sea. I enjoyed Criss Cross and All Alone in the Universe. That Julie Mulhern series is one of my favorites! The pronunciation issue would drive me crazy so I think I'm might stick to reading them vs listening!